Special Order items. Call for Pricing. The Salco/Lock Roll-feed Stapling Heads are available in a variety of configurations and styles to fit virtually any semi or fully automated corrugated case erector application. They may be ordered in top, bottom, and side-stapling models with top, bottom, or flange mounts, single or double head versions. Contact us to discuss your specific application needs. Extremely durable, the Salco/Lock roll-feed stapling heads are engineered for maximum long-term performance in the most demanding production environments. There simply are no better packaging staplers made anywhere for semi or fully automatic, stand-alone or integrated, corrugated box packaging installations. 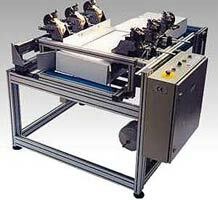 For custom engineered automatic carton-closing systems Salco offers you best modular stapling solution. with Spotnails. Increased staple load means more production. Salco/Lock automatic roll feed stapler heads provide improvements in efficiency by significantly reducing staple loading time using rolls of 5000 staples. 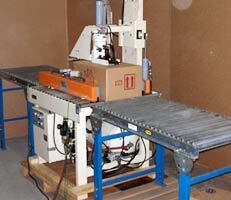 Corrugated case erector/stapler. Can be configured to staple bottom, side, top, or combinations of any 2. 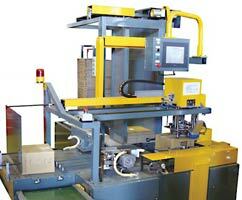 Salco Stapling Heads available designed for all configurations.